The FOMC meeting ended Wednesday afternoon with the dovish notion that the federal funds rate will stay at 2.25% to 2.50% for the remainder of 2019 and potentially longer. In addition, the Federal Reserve will slow the unwinding of its balance sheet then press the pause button in October. Lower interest rates put the squeeze on bank earnings and that puts pressure on super regional banks such as BB&T Corp. (BBT - Get Report) , M&T Bank Corp. (MTB - Get Report) , PNC Financial Services Group Inc. (PNC - Get Report) , SunTrust Banks Inc. (STI - Get Report) and U.S. Bancorp (USB - Get Report) . All five have solid gains since their Dec. 26 lows but remain in correction or bear market territory since setting their 2018 highs between January 2018 and July 2018. During Fed Chair Jerome Powell's press conference, one notion that caught my attention is that there appears to be renewed scrutiny for these larger banks. We know that BB&T wants to buy SunTrust, but such a combo would create a bank with more than $400 billion in assets. It seems that banking regulators may not approve a bank merger that results in a bank that has more than $250 billion in assets. We know that Maxine Waters, the Chair of the House Financial Services Committee, says that this potential merger deserves serious scrutiny. I will analyze these as separate banks until the dust clears. A dovish Fed and continued low interest rates put pressure on net interest margins, which is the money banks make after their cost of money and interest earned on investments. FDIC Chairman Jelena McWilliams had cautious comments when discussing the FDIC Quarterly Banking Profile for the fourth quarter of 2018. "While results this quarter were positive, the extended period of low interest rates and an increasingly competitive lending environment continue to lead some institutions to "reach for yield." With the recent flattening of the yield curve, new challenges for institutions in lending and funding may emerge. Furthermore, the competition to attract loan customers remains strong, and therefore, banks need to maintain their underwriting discipline and credit standards." 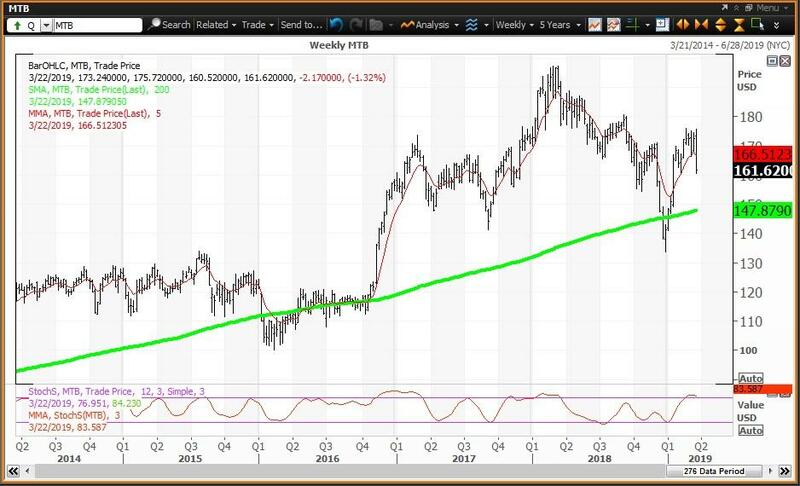 The weekly chart is negative with the stock below its five-week modified moving average at $49.31. The stock is above its 200-week simple moving average or "reversion to the mean" at $44.10. The 12x3x3 weekly slow stochastic reading is projected to end this week declining to 78.90 down from 84.36 on March 15, falling below the overbought threshold of 80.00. Trading Strategy: BBT traded as high as $52.45 on March 4, which was an opportunity to reduce holdings at my annual risky level at $51.83. My semiannual pivot is $48.42. Investors looking to buy on weakness could have done so today at my quarterly pivot at $47.30. The weekly chart will become negative if the stock ends the next two weeks below its five-week modified moving average at $166.59. The stock is above its 200-week simple moving average or "reversion to the mean" at $147.88. The 12x3x3 weekly slow stochastic reading is projected to end this week at 83.69 still above the overbought threshold of 80.00. It will take another week for this chart to become negative. Trading Strategy: MTB traded as high as $176.11 on Feb. 29 and is now below its semiannual, quarterly an annual pivots at $165.52, $166.69 and $168.89, respectively. Buy weakness to the 200-week SMA at $147.88. 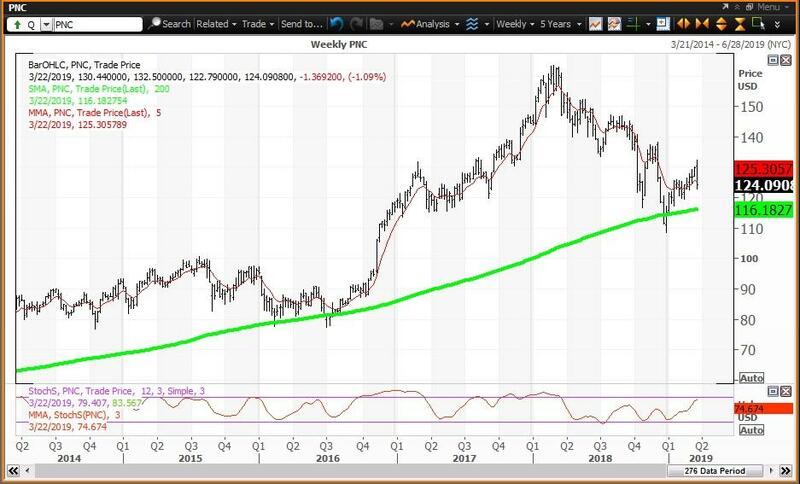 The weekly chart will become negative if the stock ends the next two week below its five-week modified moving average at $125.23. The stock is above its 200-week simple moving average or "reversion to the mean" at $116.18. The 12x3x3 weekly slow stochastic reading is projected to end this week at 74.45, up from 72.31 on March 15. It will take another week for this chart to become negative. Trading Strategy: PNC traded as high as $132.50 on March 19 and this week will be a "key reversal," given a close on Friday below last week's low of $126.96 (at $123.92 today). The stock is below its annual, semiannual and quarterly risky levels at $133.76, $137.08 and $145.38. Buy weakness to the 200-week SMA at $116.18. 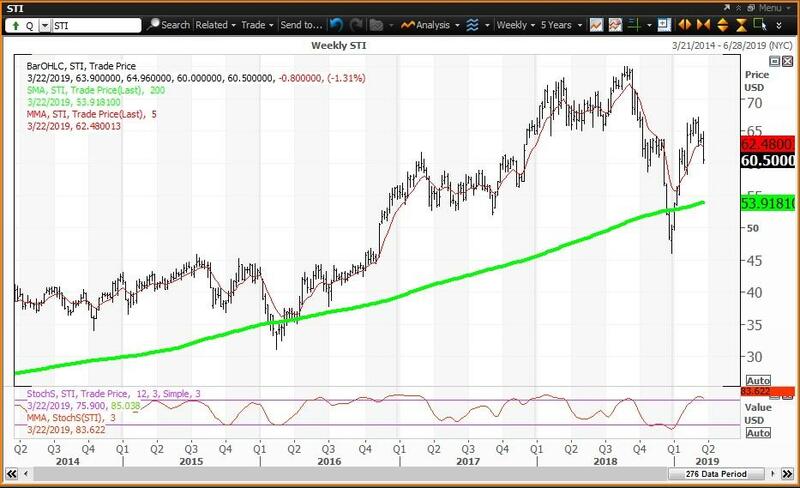 The weekly chart will become negative if the stock ends the next two week below its five-week modified moving average at $62.48. The stock is above its 200-week simple moving average or "reversion to the mean" at $53.92. The 12x3x3 weekly slow stochastic reading is projected to end this week at 83.60. It will take another week for this reading to fall below 80.00, which would make this chart negative. Trading Strategy: STI traded as high as $67.25 on March 4, which was an opportunity to sell strength to its semiannual and quarterly risky levels at $62.54 and $64.73, respectively. Buy weakness to my semiannual value level at $56.69. 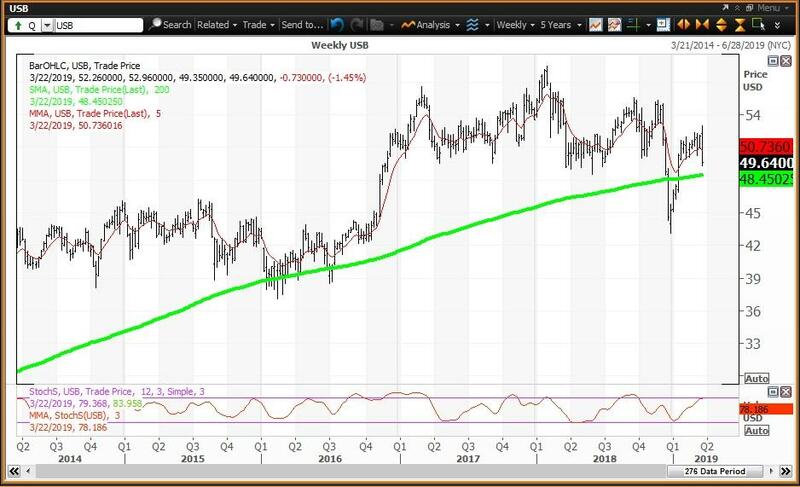 The weekly chart will become negative if the stock ends the next two week below its five-week modified moving average at $50.74. The stock is above its 200-week simple moving average or "reversion to the mean" at $48.45. The 12x3x3 weekly slow stochastic reading is projected to end this week at 78.21 up from 77.60 on March 15. It will take another week for this reading to decline, which would make this chart negative. Trading Strategy: USB traded as high as $52.96 on March 19 and this week will be a "key reversal," given a close on Friday below last week's low of $50.94 (at $49.64 today). The stock is below its semiannual and quarterly pivots at $49.43 and $49.81, respectively, and below my annual risky level at $58.22. 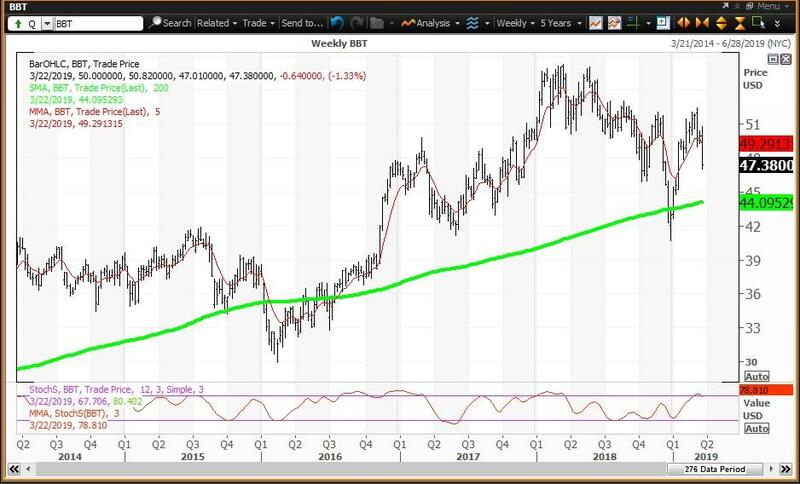 Buy weakness to the 200-week SMA at $48.45.